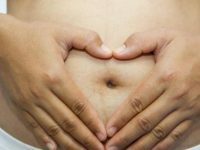 In normal child-bearing the placenta is usually near the top of your uterus or closer to the back wall. Such a location on the top and back walls protects it from accidental injury. Sometimes it can also be on the front wall, but such cases are rare. 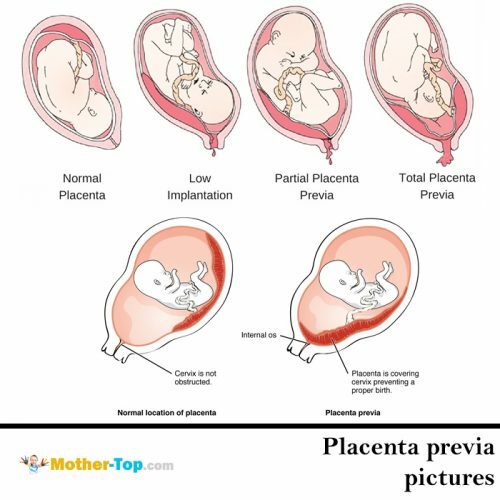 Placenta previa (I’ll call it PP) is an unhealthy condition when the placenta is in the lower part of the uterus on any wall and it covers the region of external orifice of the uterus — partly or completely. From 0.1% to 1% of women have this pregnancy complication. If the placenta only partly overlaps the region of external orifice of the uterus, it is incomplete previa, or marginal placenta previa. It happens in 70−80% of all cases. 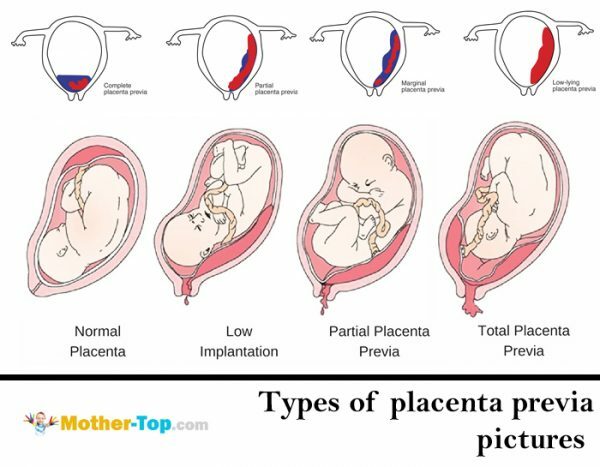 If it completely covers the region, it is a complete placenta previa. This variant occurs with a frequency of 20−30%. There are also cases of a low placenta location, when its edge is lower than normal, but it doesn’t block the external orifice. multiple complications in previous childbirth. PP is more common during the second (or subsequent) pregnancy. The fertilized egg can’t timely implant in the upper divisions of the uterus, so it drops into the lower sections. Vaginal bleeding may be in different periods of pregnancy. However, most often it is observed in the second half. On the last days of pregnancy, when the uterine contractions become more intense, bleeding may increase. The cause of bleeding is placental abruption. It happens because the placenta is unable to stretch when the uterine wall stretches. The placenta partially separates, and blood comes from the vessels of the uterus. The baby does not lose blood. However, he is at risk of oxygen deprivation, as the exfoliated part of the placenta does not participate in gas exchange. The bleeding often begins suddenly, without pain, and can be very abundant. The bleeding may stop and then begin again, or it can continue in the form of scanty secretions. In the last weeks of pregnancy the bleeding resumes and/or intensifies. In marginal placenta previa, bleeding begins at the very end of pregnancy or in early childbirth. Repeated vaginal bleeding in pregnancy with PP in most cases lead to anemia. For women with PP low blood pressure is a common condition that occurs in 25%-34% of all cases. Preeclampsia (nephropathy, late toxicosis) is also no exception for pregnant women with placenta previa. This complication causes the dysfunction of several organs and systems, and can significantly worsen the repetitive nature of bleeding. Detection of PP presents no special difficulties. 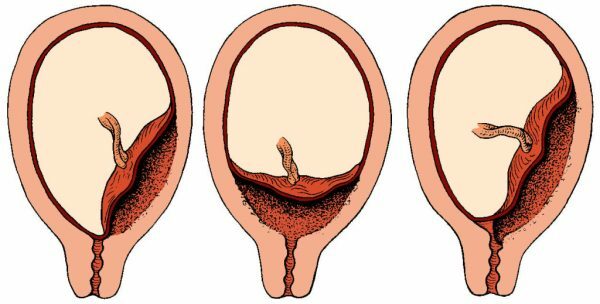 If there is vaginal bleeding, the gynaecologist first carefully inspects the vaginal walls and cervix to exclude trauma or pathology of the cervix, which can also be the cause of bloody discharge. Currently the most objective and safe method for the diagnosis of placenta previa is ultrasonography (ultrasound), which allows to establish the fact of PP, to determine the placental size and structure and to assess the degree of placental abruption. If an ultrasound examination revealed complete PP, vaginal examination is not performed. Ultrasound should be performed with moderate bladder filling. US may also detect the accumulation of blood (hematoma) between the placenta and the uterine wall as the result of placental abruption. If the abruption area is not more than ¼th, the prognosis for the fetus is relatively favorable. If a hematoma occupies more than 1/3rd of the placenta, it often leads to fetal death. After the 24th week women with PP and vaginal bleeding are treated in hospital. Doctors try to save the pregnancy until 37−38th week when childbirth becomes possible. treatment of anemia and fetal-placental insufficiency. The surgery is performed for health reasons of the mother, regardless of gestational age and fetal condition. Complete placenta previa is an absolute indication for a planned cesarean section. Natural childbirth is impossible in this situation as the placenta won’t allow the fetus to descend into the pelvic cavity. In addition, in the process of contractions, the placenta will separate more and more, and the bleeding will become very intense and dangerous. Natural childbirth for PP is still possible if the cervix is ripe, the baby is in the cephalic position and the bleeding has stopped after the opening of the amniotic SAC. If after the amniotic SAC opening there is still bleeding, doctors do caesarean section.